Another update from FSC-IC this morning: this one concerning implementation of the global Risk Assessments. I will be trying to discover FSC-US’s position and status on this. Hopefully we won’t be waiting another 2 years for this positive development. I saw an email update today from the FSC International Policy and Standards Unit (PSU) staff. It was issued informally (by email) and meant as a clarification of the Advice Note issued last week (see my 10/2 post). The upshot seems to be that FSC will allow new Chain of Custody certificates to be issued in the US to companies who object to signing the self-declaration statement in FSC-PRO-20-001. The new certificate would be issued, presumably, with an outstanding Major Corrective Action Request (CAR), which is rather odd. The assumption seems to be that some acceptable solution to the situation will be arrived at before the new deadline of March 31. So far I have not yet received word of any CoC company receiving a Major CAR for failing to sign the FSC statement. One MixedWood client audited last week was surprised when their auditor failed to even bring the subject up. We’re still unsure whether this was intentional or just an oversight. I won’t name the Certification Body (CB), but I know they are fully informed as I’ve seen copies of correspondence recently. It’s probably just a sign of the general confusion on the subject. 1.5.1 The organization shall demonstrate its commitment to comply with the Values of FSC as defined in the “Policy for the Association of Organizations with FSC” (FSC-POL-01-004, initially approved in July 2009). f) Violation of any of the ILO Core Conventions, as defined in the ILO Declaration on Fundamental Principles and Rights at Work, 1998. To guide implementation of this new section, FSC also issued a new procedure (FSC-PRO-20-001 v.1-0). Annex B of this procedure provides a required “self-declaration” statement which – as of this week – is required to be signed by all FSC-certified companies. For a number complicated reasons (USCIB summery – US law) this creates an unacceptable legal situation for many US companies. The list includes some very prominent and recognizable names and key supporters of FSC-US. An informal group of these companies have been lobbying FSC for at least a year – assisted by FSC-US staff – with little or no progress. The conversation seems to have become a bit more focused recently (my 10/2/12 blogpost), but the parties still don’t seem to understand one another. FSC European staffers seem genuinely puzzled that a problem even exists. The FSC international policy and standards unit (FSC PSU) issued a “PSU Advice” to Certification Bodies late yesterday. It is meant to address a pending crisis among a number of large US companies who are objecting to the language a required self-declaration document now required of all CoC-certified companies. The policy advice (FSC-PSU_Letter CBs_10.1.12) does what FSC does best: it defers a decision to a later date. But it doesn’t defer it much. MixedWood has a couple of high-profile clients who have scheduled surveillance audits coming up in the next few weeks. Because they do not plan to sign the FSC statement, their auditor will have to raise a major non-conformity. Ordinarily, major NC’s have to be closed within 3 months. This advice memo extends this due date until March 31 of next year. Will this turn out to be a non-issue or a major crisis? My best guess is that we’ll find out on March 30. I’m note quite sure which anniversary they are celebrating. The FSC website designates 1993 as their founding year. I distinctly remember the early days of the SFI program in 1994-95. How ever you slice it, we’ve been at this a long time. I expect that we’ll be seeing more retrospectives like this in the next year or two. Of course, I pay more attention to these things than most people do. My first impression wasn’t very positive. 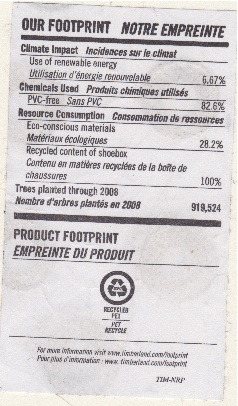 The concept behind “OUR FOOTPRINT” is a good one. Timberland seems to be making an attempt at taking responsibility for their environmental impact. But the details are a bit weak. Use of renewable energy: 6.67%. Is this good or bad? And what on earth is an “Eco-conscious material”? The opposite of an eco-unconscious material? The fact that Timberland has (apparently) planted somewhat more than 900,000 trees in the last 4 years might sound impressive, but as a forester I find this sort of claim the weakest of all. The best quality information can be found by following the link at the bottom of the tag: www.timberland.com/footprint This site is interesting, and suggests a well thought-out and sincere program. It’s worth a look. SFI in the news: What did they miss? The piece has an engaging title: “The Toilet Paper Chase”. I am impressed at their technique of following a common and very familiar household product from the store shelves all the way back to the forest. Unfortunately, they failed (in my opinion) to avoid the typical two dimensional approach that TV news usually takes to complex subjects. I think FSC got a pass here. 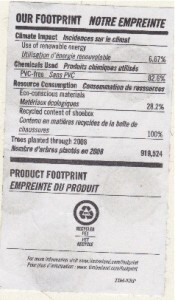 The introduction mentions that SFI is one of several green “eco-labels” that consumers find on product like toilet paper. It even mentions FSC by name and briefly flashes the logo a couple of times. Some FSC products – including one brand of toilet paper – are even shown; but only fleetingly. It looks like SFI and Irving took it on the chin for being bold enough to display their brand proudly. That’s a shame.